Welcome to the wiki of [http://www.hackuarium.ch/ Hackuarium] community. At Hackuarium, we want to bring biology (and biologists) to the world, and the real world back to biology. Our laboratory is an excuse to meet and discuss, build and develop ideas in a neutral, open, noncompetitive and not-for-profit environment. This page was launched during our [[1st Ever Hackuarium Wiki Sprint]] that took place on 7 December 2014. As you might notice quickly, it is a work-in-progress. Comme vous pouvez le voir, cette page est en chantier toujours et a été construite pendant le [[1st_Ever_Hackuarium_Wiki_Sprint | 1er Hackuarium Wiki Sprint]] qui a eu lieu le 7 décembre 2014 à UniverCité. Plus d'information sur [https://en.wikipedia.org/wiki/Do-it-yourself_biology Wikipedia] (en anglais). [http://DIYbio.org DIYbio.org] and [http://DIYbio.eu DIYbio.eu] are the portals of the international and european communities, respectively. For more information, visit the [http://www.wikipedia.org Wikipedia] page dedicated to [https://en.wikipedia.org/wiki/DIYbio DIYbio]. Nos membres pratiquent une science ouverte et participative, en dehors des institutions traditionnelles, dans le respect de la [http://diybio.org/codes/draft-diybio-code-of-ethics-from-european-congress/ charte éthique] du mouvement DIYbio EU. Nous favorisons par tous les moyens l'interdisciplinarité, et nos projets sont portés aussi bien par des scientifiques que par des citoyens architectes, designers, informaticiens, journalistes ou retraités. Our laboratory in Renens (Switzerland) is open to anyone sharing the values of the association and who is dedicated to follow the [http://diybio.org/codes/draft-diybio-code-of-ethics-from-european-congress/ DIYbio Europe ethical guidelines]. Our projects are initiated and carried out by scientists as well as non-scientists from a variety of background. They are passionate about tinkering with biology in particular, and technology in general. Some are engineers, architects, designers, IT and computer scientists or retired professionals, but others have no scientific education. They are mostly citizens interested in open and participatory research and innovation, outside the contrains of traditional institutions. Hackuarium members want to investigate new ways of carrying out interdisciplinary research and innovation, by making their results accessible (low-cost), simple and easily reproducible (low-tech) and by promoting an open source philosophy. 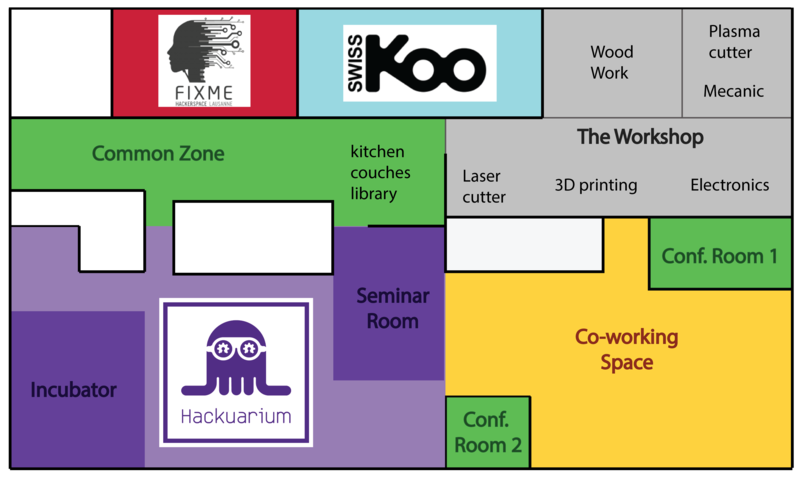 Hackuarium is proudly using infrastructures provided by [http://www.univercite.ch UniverCité], an unconventional innovation hub opened in May 2014. Our equipment is mostly upcycled material from institutions and industries from western Switzerland. [[People | Check us out]], and find out what makes Hackuarium a good mix. Les rôles et les membres du [[Board|comité de l'association]] Hackuarium sont détaillés sur la [[Board|page dédiée]]. Les [http://wiki.hackuarium.ch/w/Category:Board_Meetings minutes des Board Meetings sont rassemblées dans cette catégorie]. The Agenda of the last board meeting can be found [[20151128_Board_Meeting | here]]. ::<li>'''2016.06.14''' Tuesday SAVE THE DATE [http://opendata.ch/2015/11/opendata-ch2016-am-14-juni-in-lausanne/ Opendata.ch/2016 Conference], Casino de Montbenon, Lausanne. ::<li>'''2016.04.27''' Wednesday 19:30-21:00: [[Openhackuarium_vol._95 | Openhackuarium vol. 95]] T-shirt printing session! ::<li>'''2016.04.13''' Wednesday 19:30-21:00: Openhackuarium vol. 93 'Genomic integrity' and DIY 'comet assay' on cheek cells. ::<li>'''2016.03.08''' Tuesday 16:50 [[Events:Entre_Bière_Hackers_et_ADN_Café_Scientifique_au_Collège_Rousseau |Entre bière, hackers et ADN]] The [[BeerDeCoded| BeerDeCoded project]] on stage at the Café Scientifique of Collège Rousseau (Geneva). ::<li>'''2016.03.04''' Friday 19:30-22:30 Visite of Hackuarium by participants of the [[GOSH_meeting | Gathering for Open Science Hardware]] (aka [http://openplant.org/oshwforscience/ GOSH!]). ::<li>'''2016.02.12''' Friday 9:00-11:00: The [[Living_Instruments| Living Instruments]] project will be featured as part of the official [http://liftconference.com/lift16/workshops/living-organisms-musical-instruments-unprecedented-performance Lift Conference] program. ::<li>'''2016.02.10''' Wednesday 19:30-21:00: School trip to the music venue [http://www.le-bourg.ch le Bourg] for an [http://www.wespoke.ch/les-concerts/le-bourg-2-hackuarium/ Openhackuarium vol. 84 special music] featuring the [[Living_Instruments| Living Instruments]] project. ::<li>'''2016.02.03''' Wednesday 19:30-21:00 Participants to the Biodesign.cc [http://wiki.biodesign.cc/wiki/Winter_School Winterschool] visit [[Openhackuarium_vol._83 | Openhackuarium vol. 83]]. ::<li>'''2016.01.20''' Wednesday 19:30-20:30: [[20160120_General_Assembly | General Assembly]] of the Hackuarium association. Please come, as a member, or as a friend! ::<li>'''2015.12.09''' Wednesday 19:30-21:00: [[Openhackuarium_vol._75 | Openhackuarium vol. 75]] with a presentation of the project beMap. ::<li>'''2015.12.02''' Wednesday 19:30-21:00: [[Openhackuarium_vol._74 | Openhackuarium vol. 74]] with presentations about open source projects in protein science and more! ::<li>'''2015.11.28''' Saturday 9:30-15:30: [[DNA_Party_workchoppe_vol.2 | The real Beer DNA workshop]] Sign-up! Limited space available. ::<li>'''2015.08.05''' Wednesday 19:30-20:30: [[Openhackuarium_vol._57_%22Bi%C3%A8re%22 | #OpenHackuarium vol. 57]] special Fermentation. ::<li>'''2015.07.22''' Wednesday 19:30-20:30: [[Openhackuarium_vol._55_-_22.07.15 | #OpenHackuarium vol. 55]] special Urban/Vertical farming. ::<li>'''2015.07.18''' Saturday 9:30-15:30: [[DNA_Party_workchoppe_vol.1 | A first DNA workshop/workchoppe]]. ::<li>'''2015.04.22''' Wednesday 19:30-20:30: General Assembly of Hackuarium association. ::<li>'''2015.04.16''' Thursday 19:00-21:00: Discussion with Le Pansement, a medical students association. ::<li>'''2015.04.15''' Wednesday 18:30-21:00: Practical Session "Garage Electrophoresis" with Le Pansement, a medical students association. ::<li>'''2015.03.29''' Sunday 13:30-18:30: [[2nd_Hackuarium_Wiki_Sprint | Hackuarium Wiki Sprint #2]]. ::<li>'''2015.03.28''' Saturday 10:00-18:30: [[Open_DNA_Seq_Workshop | Open DNA Sequencing Workshop]]. ::<li>'''2015.02.18''' [[Visite_du_FlyLab_Paris_chez_nous| Drone night]] with Flylab Paris (part of La Paillasse) (FR). ::<li>'''2014.12.07''' [[1st_Ever_Hackuarium_Wiki_Sprint | Hackuarium Wiki Sprint #1]]. ::<li>'''2014.11.27''' [[Events:BSNL_Roundtable | Roundtable at EPFL organised by BNSL]]. ::<li>'''2014.11.05''' [[Events:Bioart_NexTrends | NexTrends/ECAL Bioart conference]] at UniverCité. ::<li>'''2014.10.22''' [[Events:Open_Access | Open Access conference]] at UniverCité. ::<li>'''2014.10.09''' Conference by French artist [http://liagiraud.com Lia Giraud]. ::<li>'''2014.09.25-27''' [[Events:Design_Days_2014 | Design Days 2014]]. ::<li>'''2014.09.24''' Conference by [http://www.nicolasnova.net Nicolas Nova], co-fondateur du [http://nearfuturelaboratory.com Near Future Laboratory] et enseignant à la [http://www.hesge.ch/head/ HEAD], Genève. ::<li>'''2014.08.27''' Introduction to [http://bricobio.org BricoBio] Montreal by Sarah Choukah. ::<li>'''2014.08.20''' Introduction to [http://lapaillasse.org La Paillasse] Paris by Clément Epié and Nicolas Loubet. ::<li>'''2014.06.06-07''' [http://hackteria.org/wiki/Tech4Dev Water Hackathon] organised by Hackteria. 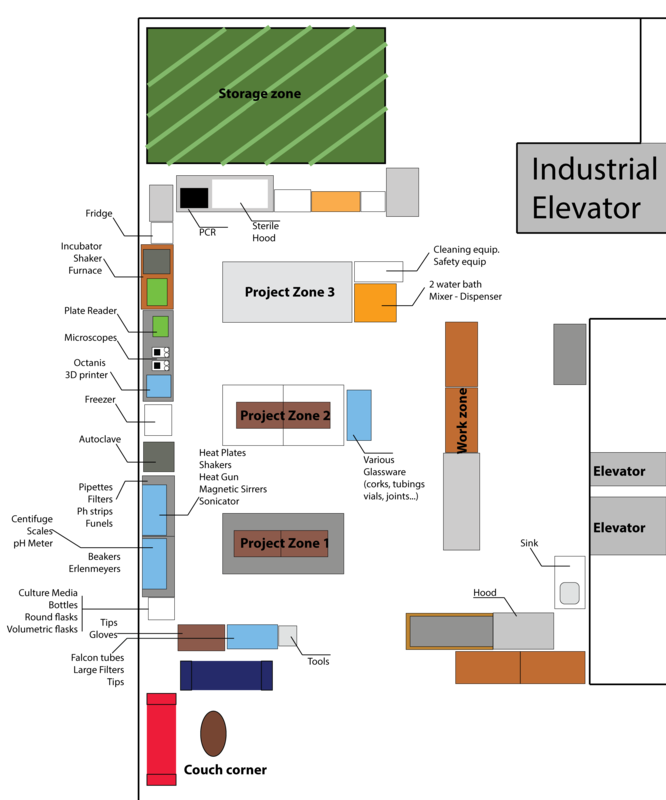 Following this [[ Media:map1.png | link]], you will find the plan of Hackuarium with the position of equipment. Sur [[ Media:map1.png | ce lien]] la carte montrant la vue d'ensemble d'Hackuarium détaillant ou se trouve la majorité du matériel. [[Life_Main | This page ]] describe the code of conduct for Hackuarium members. Tu viens d'arriver? tu cherches tes repères? Alors commence alors par lire [[I m new | cette page ]]. [[Life_Main | Cette page ]] recense les codes de bonne conduite à adopter à Hackuarium ainsi que les quelques règles s'appliquant dans certains cas spécifiques. ::<li> A description of the different ways of carrying out the protocol. Ideally there should be a description of a commercial kit and a DIY kit. ::<li> Information specific to Hackuarium and where to find the components, tools and reagents. [[Instru_Main | This page ]] describes all the instruments available at Hackuarium (work in progress..), their location and how to use them. ::<li> Un protocole décrivant les différentes procédures pour appliquer le procédé. Idéalement il y aurait une description pour le faire avec un kit commercial et un moyen DIY. ::<li> Une partie détaillant les précautions à prendre pour travailler en toute sécurité. ::<li> Des informations spécifiques à Hackuarium décrivant ou se trouve les instruments et comment les utiliser. This document contains all the instruments and tools we need. If you happen to have a piece of equipment we are (or may be) looking for, [mailto:hello@hackuarium.ch contact us]! [[Instru_Main | Cette page ]](Anglais) recense tous les instruments disponibles sur le lieu, leur position ainsi que la manière dont ils doivent être utilisés. Consumables can be purchased from [http://www.huberlab.ch Huber Lab]. Swiss-based [http://www.smiples.ch Smiples] has a very extensive listing of second hand laboratory and technical items. These can be bought from their online shop or from [https://www.ricardo.ch/online-shop/smiples/?SellerNickName=Smiples Ricardo]. Vous trouverez dans le [[Press_kit | Press Kit]] tous les détails concernant notre passé médiatique. This page was last modified on 17 September 2018, at 09:02. This page has been accessed 456,765 times.